Earth Hour has grown to become the world’s largest grassroots movement for the environment. Reducing our home energy consumption is something that we should work at every day but once a year there is a special event that makes it easier to keep that goal top-of-mind. Earth Hour, an initiative of the World Wildlife Fund (WWF), challenges people simply to turn out the lights for an hour to draw attention to the impact our energy use has on climate change.The idea is to have fun in the dark and think about how you can inject some Earth Hour spirit into your everyday life. This year’s event is on Saturday, March 25, from 8:30 to 9:30 local time. Earth Hour started as a single event in Sydney Australia in 2007. In that first year 2.2 million residents and businesses took part by turning out their lights for an hour on one coordinated evening. The result was a 10 per cent reduction in power draw on the grid which prevented 25,000 tonnes of carbon dioxide emissions. Last year 178 countries and territories took part in the event. Over 6600 community events were logged and even iconic landmarks participated, including the Sydney Opera House, Big Ben and the Houses of Parliament in London, the Tokyo Tower, the Empire State Building, Marina Bay Sands Hotel (Singapore) and the Eiffel Tower. Earth Hour is one of those great acts of global solidarity that anyone can take part in. I love how it empowers people (especially children) to be part of something that actually makes a difference. Celebrating in the dark is a thought provoking way to ignite change by getting people to think about their impact on the planet. And it gives kids a tangible example of how their everyday activities can affect the planet. If you have an outdoor fireplace, invite your neighbours over for a chat by the fire. Toast marshmallows or make s’mores. Give it a try and you’ll discover that togetherness feels different when the power is out. We engage more with one another without the distractions of television or the computer and I think we listen better in the dark. 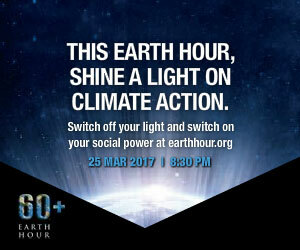 However you choose to celebrate, consider registering your participation on the Earth Hour website so you’ll be counted.